The BMW i8 Coupe has been designed for dynamic driving and agility without forgetting the importance of sustainability and environmental responsibility. The powertrain and powerful electric motor up front combined with a twin turbo petrol engine in the rear ensures excellent acceleration values and low fuel consumption. 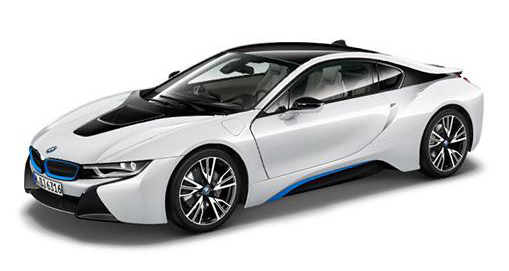 The futuristic looking i8 coupe is fast, agile and delivers an engaging drive that’s both economical and tax-saving. Three driving options allow for sports-car performance that will match BMW’s M4, peaceful and ultra-effective hybrid mode that’s no slouch, reaching 62mph in just 4.4 seconds. The battery only option will reach speeds of up to 75mph and cover an impressive 34 miles on electricity alone. The light weight of a mere 1,535kg relies on carbon fibre and aluminium sub-frames along with lightweight exterior panels. A recent update has given the battery 70% capacity more than its predecessor and reduced CO2 emissions to as low as 42g per km. Front damper calibration and a bolder rear anti-roll bar has improved steering. BMW Laser lights include both LED and laser technology for enhanced illumination and the athletic styling sits atop 20” BMW I light alloy wheels encased in 195/50R20 tires up front and 215/45R20 tires in the rear.